May 28th, 1754: Military commander George Washington, fighting for the British, destroys a French regiment in the first major battle of the French Indian Wars. May 28th, 1934: Birth of the world's first surviving quintuplets; Annette, Cecile, Emilie, Marie and Yvonne Dionee are born in Ontario, Canada. May 28th, 1959: Two monkeys become the first living creatures to survive a space flight after they were sent up into space by America. May 28th, 1987: A 19 year old West German, Mathias Rust, surprises the Soviet authorities by flying a light plane from Helsinki to Moscow and landing safely in Red Square. 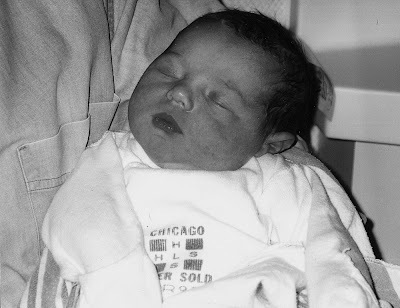 And on May 28th, 1997...Emma Grace Elsmo entered the world. She announced her own arrival with cries so loud that nurses from other rooms came into see what all the fuss was about; she was born with undeniable confidence. She had the tiniest red lips, a head full of jet black hair, and a skeptical look in her eye. She was alert and aware and and as independent as a new born can be. When I gazed at her for the first time I knew right away she was an incredible spirit hiding behind a veil of infancy; my anticipation of our years together was born in that instant. Suddenly she is twelve and finishing the last chapter of her childhood. Today Emma's confidence remains, but is well balanced by an admirable respect for all creatures. She is a generous, self motivated, and positive. Her initial skepticism has been replaced with a sincere appreciation for every day. I cannot imagine my life without her and consider the world a better place because she is in it. Our lives are forever improved for having met you twelve years ago. she is all that and more...happy birthday.